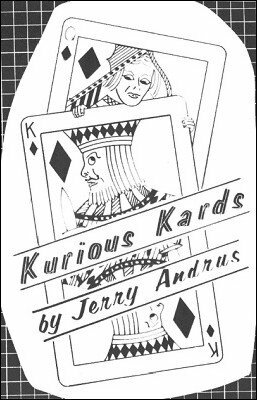 Here is a book replete with many of my ideas on Kurious Kards. Magicdom certainly has its share of "Take A Card" tricks -- "Mental Marvels" and "Mathematical Monstrosities." Why then couldn't it stand a little material that is either different enough to be sort of crazy, or crazy enough to be sort of different? This book is not intended to be encyclopedic in nature, but rather just presents ideas that I have worked out over the years and recently. So here is my contribution of "Selectified Kard Insanities." Some are easy, some are difficult. They are not tricks within themselves but rather a very entertaining vehicle to be used during the course of your card magic. 1st edition 1973, PDF 30 pages, profusely illustrated.